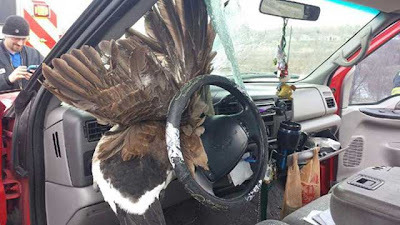 A woman from Golden, Colorado says she was driving in Adams County on Wednesday when she saw some birds in the distance trying to take flight. Next thing she knew, one of them - a goose - smashed right through her windscreen. 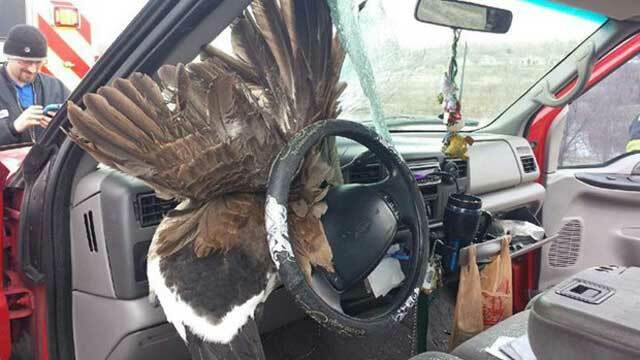 "The bird came up and just went 'bam,' right into my windshield," Shannon Jergenson said. "I turned my head and when I opened my eyes the bird was ... its head just kind of fell over." After the goose ended up impaled on the steering wheel, Jergenson turned her head to stop glass from hitting her face. She was doing about 50 miles per hour when the goose came crashing in. She managed to pull over, and suffered only a small scratch. Colorado State Patrol says they've never seen anything like it.